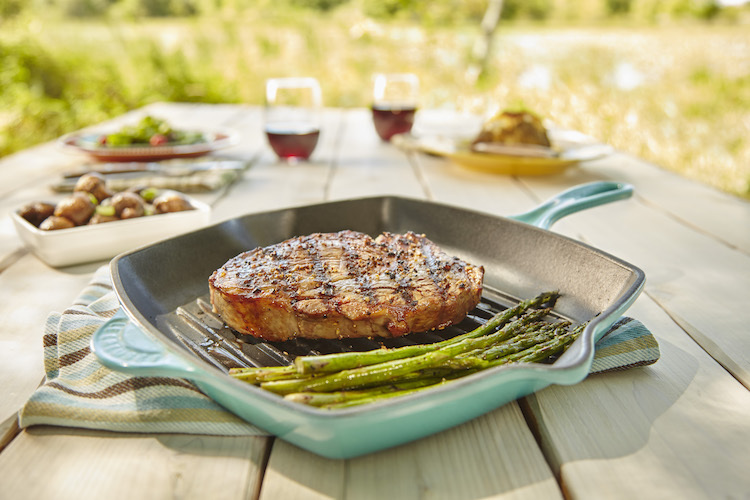 It’s time to fire up the grill for your Labor Day celebration! I plan to spend the day outside enjoying the weather with family and friends. Whatever you plan to do, I hope you enjoy some delicious food and get good use of your grill before cooler weather hits. 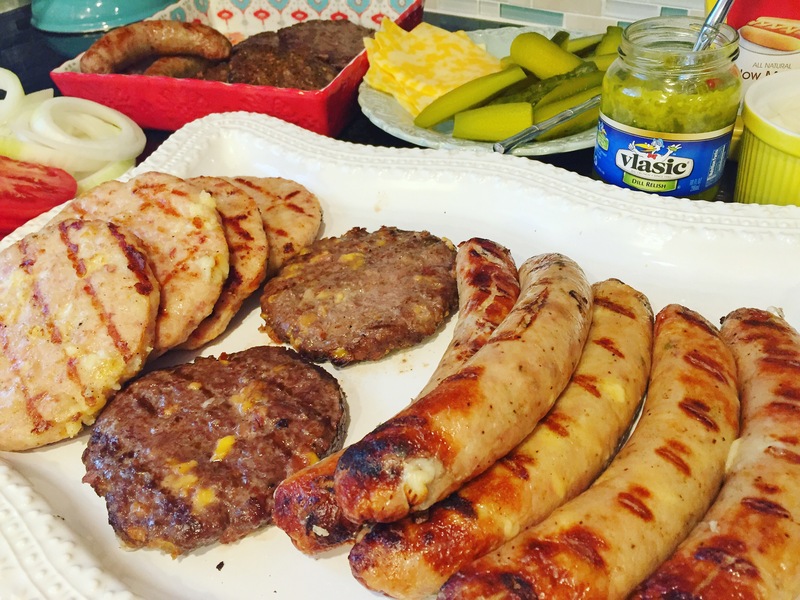 It’s the perfect day for grilling and a picnic. 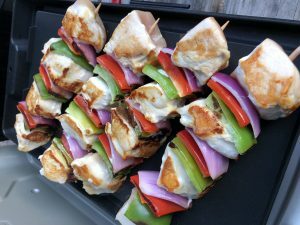 I have a handful of grilling ideas and side dish suggestions for you to try to have the perfect spread. Let’s start with the meat! 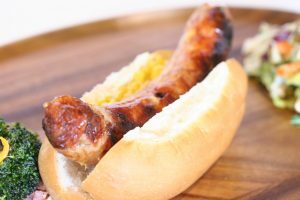 Brats – there are so many brat varieties available, you are sure to find something for everyone on your guest list. 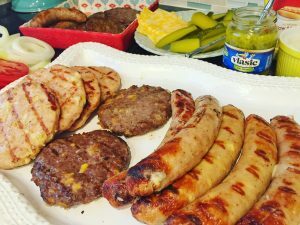 My favorite is the Chicken Fajita Brat found at the Chef’s Counter of your local Festival Foods. Other varieties available include Philly Cheese Chicken, Octoberfest, Jalapeno Cheddar, Wild Rice, and more! Don’t forget the fresh brat buns from the bakery! Burgers – probably the most popular food to grill. Plus, burgers are extremely customizable with a wide variety of toppings. 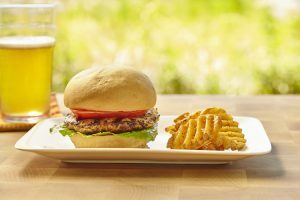 My go-to burger of choice is Ground Chicken Bacon & Swiss from the Chef’s Counter. Other options include regular Ground Beef, Bacon Cheeseburger, Blue Cheese, and Montreal. Don’t forget the fresh burger buns from the bakery! 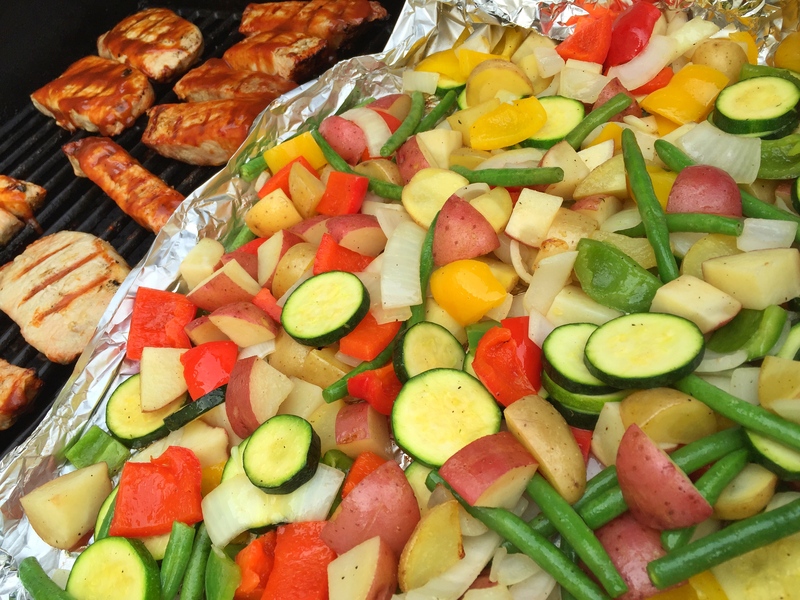 Chicken – my favorite meat to grill! You can get fresh Dad’s Boneless Skinless Chicken Breasts from the Chef’s Counter and they are just under 1lb each! So, you get a large portion. These are available with buffalo, garlic butter, teriyaki, or no seasoning. Other chicken varieties are also available. 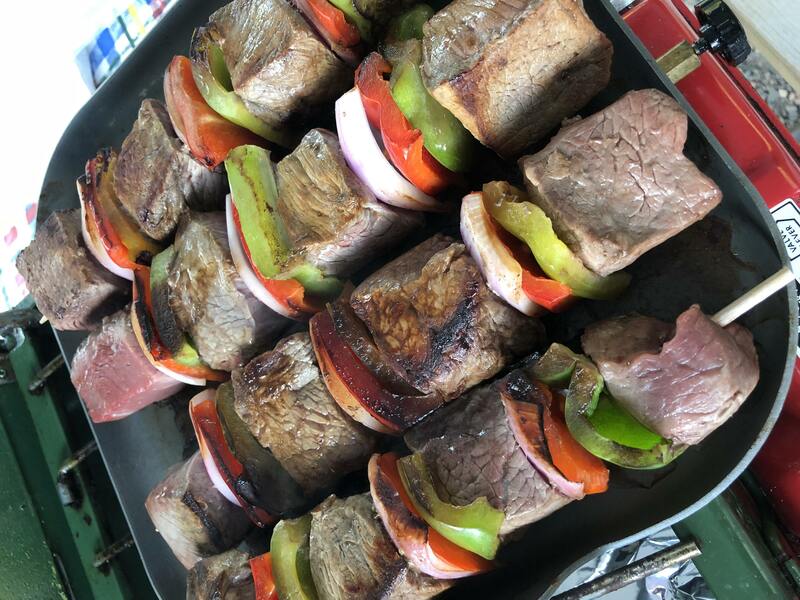 Kabobs – Black Angus Beef Sirloin and Chicken Breast Kabobs with fresh sliced veggies are available from the Chef’s Counter. Thick and juicy cuts of meat with a variety of veggies. Eat plain, sprinkle with some seasoned salt, or enjoy with your favorite dipping sauce. Other meat options that are great for grilling include steak, ribs, and salmon. 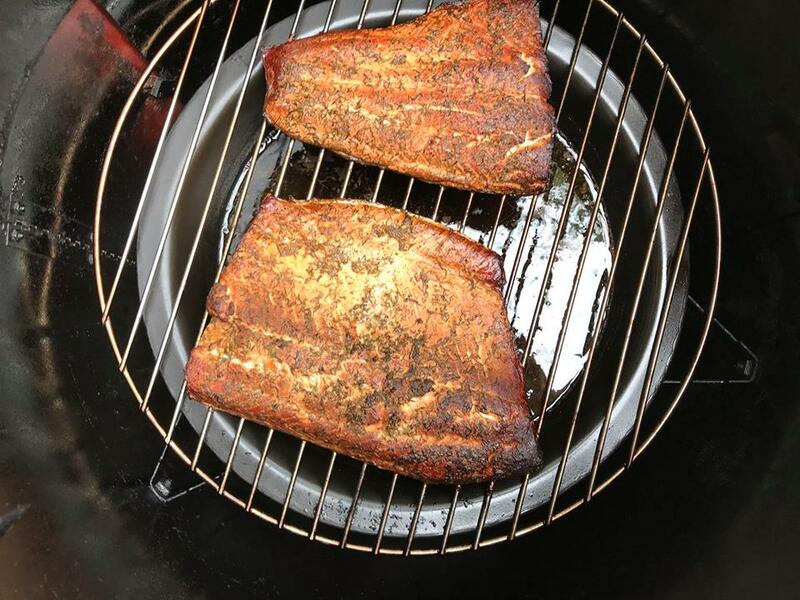 Pick up a Cedar Plank to grill with to add some great flavor to your meal. Next let’s talk about side dishes! 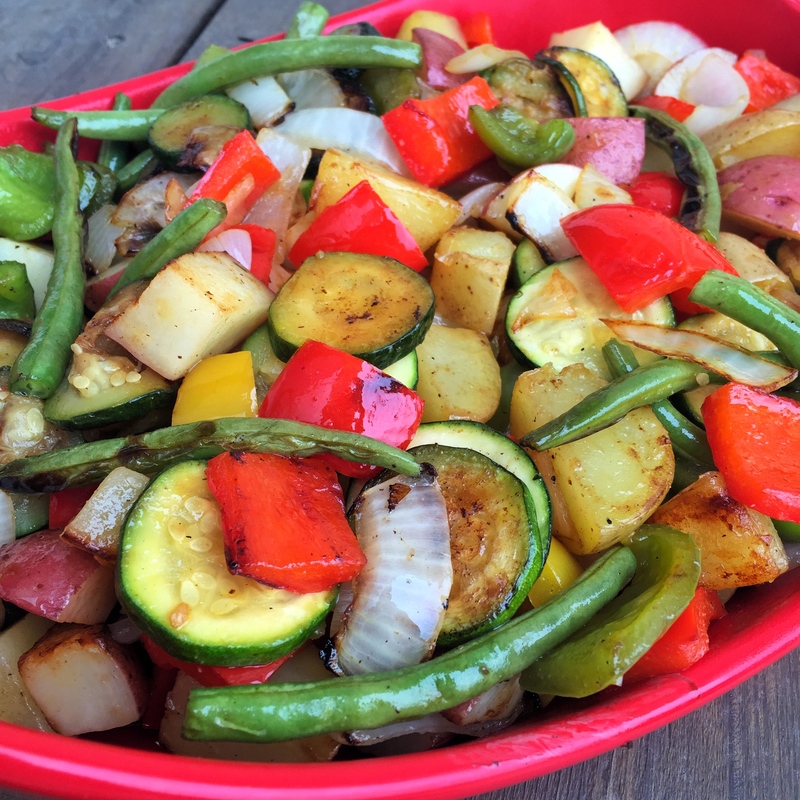 Grilled veggies are one of my favorite side dishes of summer. Grilling brings out the natural sweetness and enhances the taste. 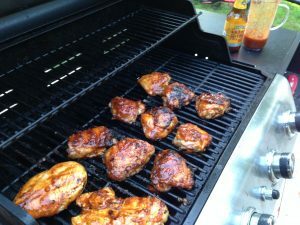 Add some seasoning or marinade and you can really kick up the flavor! 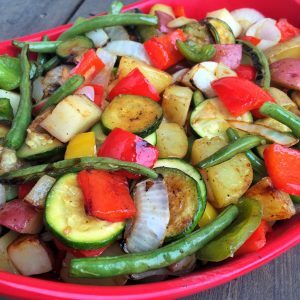 My go-to veggies for grilling include bell peppers, onion, zucchini, squash, corn, carrots, and asparagus. 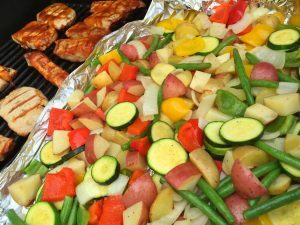 You can also chop up some potatoes or grill whole in some aluminum foil. The Deli Department at your local Festival Foods is stocked with plenty of side dishes as well. You can choose from the “hot bar” if you want to keep it simple and not do a lot of work. Think fried chicken, mashed potatoes, macaroni and cheese, etc. You can also select “take and bake” items such as boneless wings, cheesy hash browns, pizza, macaroni and cheese, alfredo pasta, and more. 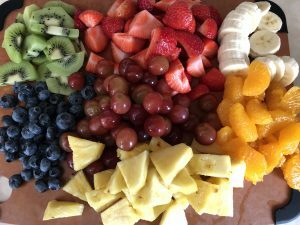 The “cold bar” contains a lot of freshly made salads that will pair perfectly with your grilled food; pasta salad, potato salad, chicken salad, veggie medley, egg salad, Texas Caviar, fresh fruit, and much more. 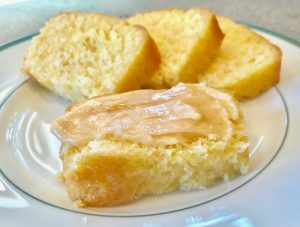 Add a few loafs of cornbread and your guests will be in heaven! 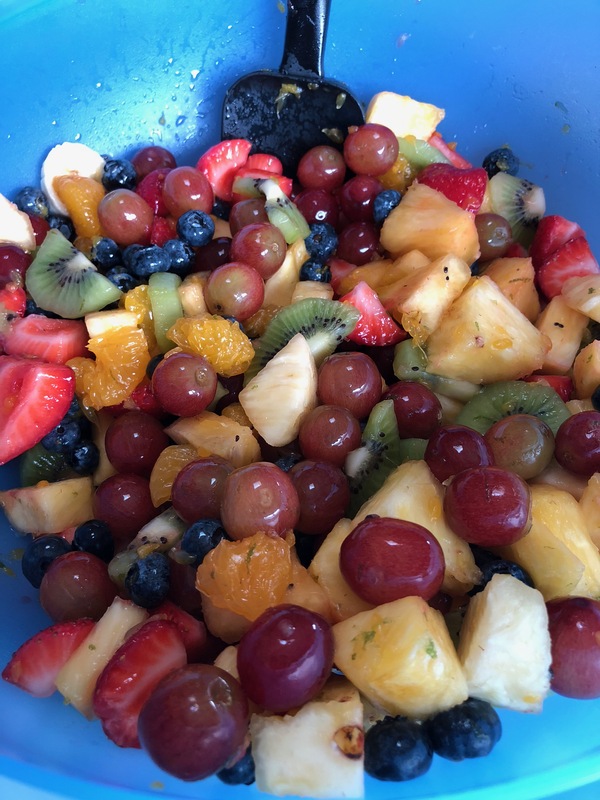 This is my favorite recipe for fruit salad – Rainbow Fruit Salad with Honey Lime Drizzle. It’s full of fresh chopped fruit, has every color of the rainbow, and is bursting with citrus flavor. The honey lime drizzle can be completely optional, but I think really enhances the flavor. Finally, we can talk about dessert! You can simplify this stage of the meal by picking up some fresh baked cookies, cupcakes, a cake from the bakery, or you can make your own dessert. I love to bake but sometimes I like to go with a basic yet delicious dessert option that is ready in no time! Frozen Chocolate Dipped Bananas – these are a quick and easy dessert to assemble. The hardest part is waiting for the bananas to freeze! 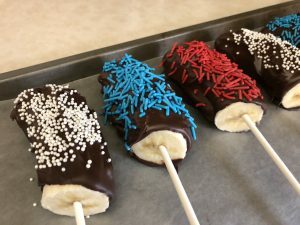 Simply peel and slice the bananas in half and add a skewer to each. Then dip in the melted chocolate and cover in sprinkles. Place in the freezer for at least an hour but ideally longer, before eating. 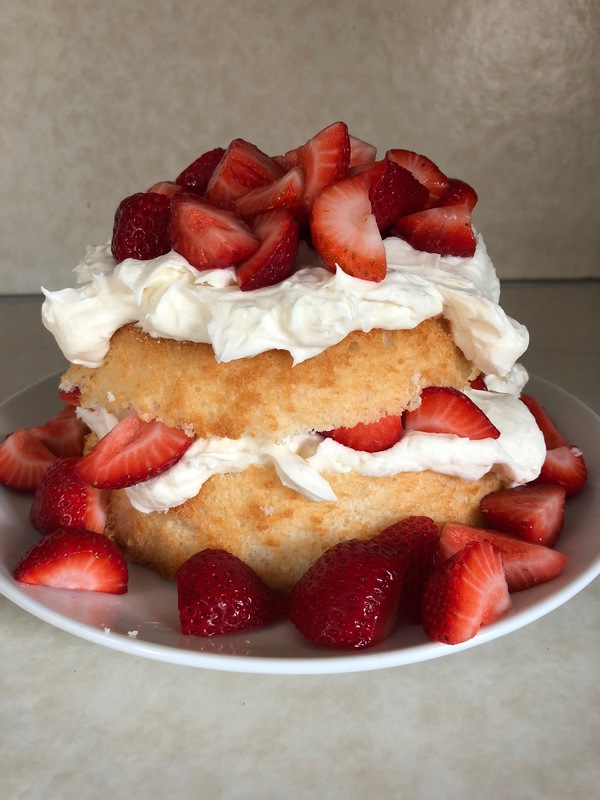 Angel Food Cake with fresh strawberries and whipped cream. Don’t let this dessert scare you. It’s SUPER simple to make. I used store-bought angel food cake, so I didn’t have to make my own. 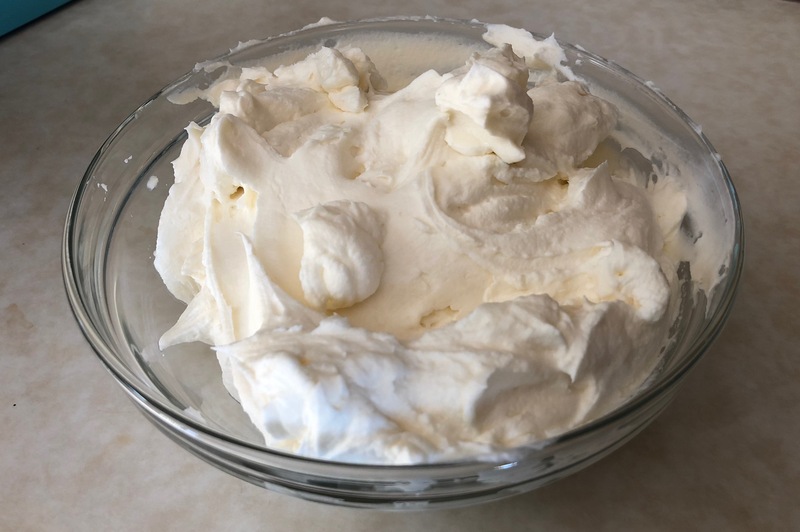 I did however make my own whipped cream, but it takes few ingredients and about 5 minutes to whip together (no pun intended). 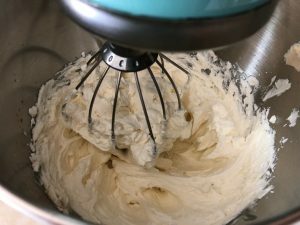 I find it easiest to make the whipped cream in a stand mixer, but you can also use a hand mixer. Combine the ingredients, whip on medium speed for a few minutes, sample for taste, and enjoy! Slice the angel food cake in half (through the middle), add some whipped cream and chopped strawberries, place the other half on top, add more whipped cream, and top with more chopped strawberries. A perfect dessert for Labor Day! I hope you’ve enjoyed reading my long list of options! Combine a few or a lot of the items listed and you will have one heck of a Labor Day party 🙂 Enjoy your celebration! 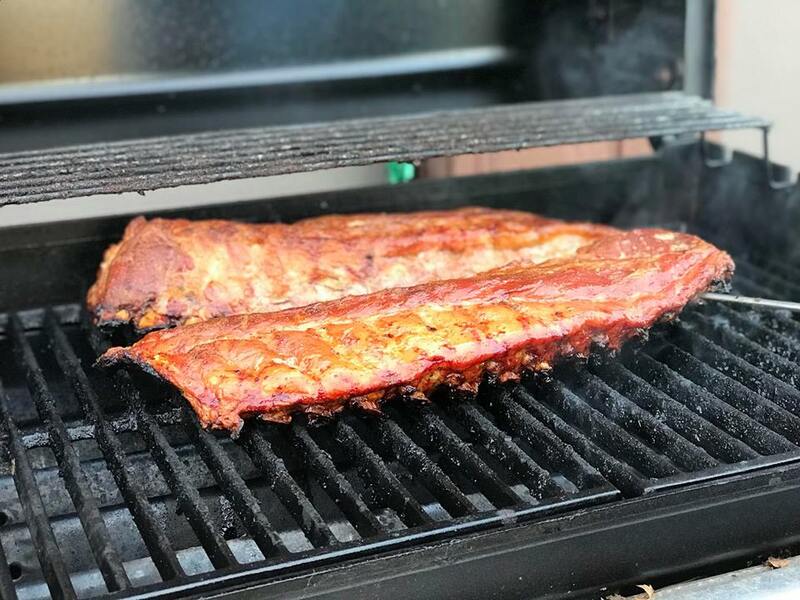 This entry was posted in Labor Day Weekend, Uncategorized and tagged Angel Food Cake, Brats, Burgers, chicken, dessert, fish, Fruit Salad, grilling, Kabobs, Labor Day, Pasta, Ribs, salad, salmon, Steak. Bookmark the permalink.